Informazione prodotto "Sefour LR100 DJ Carry Rack 8U nero"
The portable LR100 Studio & DJ Carry Rack by Sefour comes with a simple but effective design. It has a built in handle for moving key studio or DJ pieces around studio or mobile set up. The rack is ergonomic with tilt adjustment, so that the rack equipment is perfectly positioned according to your personal setup. You can put this unit exactly where you need it for ultimate comfort. Capable of storing 8U of equipment, this very strong and stable U rack is the perfect housing for your professional equipment. 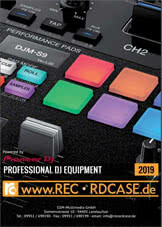 Sii il primo a scrivere una recensione per: "Sefour LR100 DJ Carry Rack 8U nero"